La'o Hamutuk: TL is borrowing more - will we be able to repay? TL is borrowing more - will we be able to repay? In order to continue high infrastructure spending while appearing to reduce withdrawals from the Petroleum Fund, the Timor-Leste Government has signed several loan agreements with multilateral agencies and foreign governments. Although Timor-Leste’s current debt is relatively small, the Government’s borrowing plans have accelerated in recent years; the 2017 State Budget projects spending nearly $1.2 billion in borrowed money between 2017 and 2021. La’o Hamutuk agrees that Timor-Leste needs better infrastructure, and loans are one mechanism which governments can use to finance infrastructure or other socially or economically beneficial projects. However, we see that the Government is instead planning to borrow to supplement unsustainable, unviable projects, whose total costs are so high that it would be impossible to justify paying for them only with money from the Petroleum Fund. At the same time, the availability of loans is allowing politicians to avoid making the difficult but necessary choices about how to bring government expenditures down to sustainable levels. As Timor-Leste’s petroleum revenues will soon end, the Petroleum Fund’s sustainability is in doubt, and the non-oil, non-state economy has barely improved since independence, La’o Hamutuk fears that taking on hundreds of millions or billions of dollars in debt will put a heavy, unfair burden on future generations and could result in Timor-Leste being unable to pay its debts, which would have severe consequences for our people and economy. Therefore, this article describes Timor-Leste’s current and future borrowing, explains La’o Hamutuk’s concerns about the current policy and suggest how Timor-Leste can avoid falling into unsustainable debt. We hope that it will increase public understanding of this important issue and help Timor-Leste’s policy makers to critically review their borrowing plans. 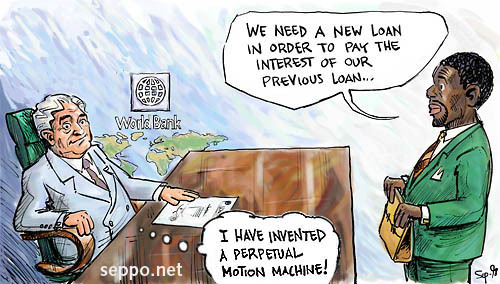 In 2009, the Government passed laws paving the way to borrow from foreign institutions, and it began to sign loan contracts in 2012. It has since agreed to borrow money for seven projects, six of which are road upgrades, the other being a drainage project in Dili. Some projects only use a single loan, while others involve multiple loans. As of November 2017, Timor-Leste has signed loan contracts totalling about $400 million, which is scheduled to be borrowed from creditors over the next five years, with repayments continuing until the mid-2040s. The loan-financed projects are currently in various stages: some have already been completed, while others have faced long delays and have only just begun or are stalled. Out of the total amount contracted, Timor-Leste has already received and spent about $97 million, and much more will be disbursed by lenders in the coming year as more projects begin construction phase. The main justification given for borrowing is that Timor-Leste needs to build infrastructure, but it has limited financial resources to do so. Therefore, rather than continuing to withdraw too much from the Petroleum Fund (PF) and reducing its sustainability, loan proponents in the Government and lender agencies argue that borrowing can reduce these withdrawals while allowing the necessary infrastructure spending to continue. However, the Government is not reducing its withdrawals from the PF as it borrows more; rather, it is planning to continue withdrawing unsustainable amounts from the PF every year. Indeed, the 2017 State Budget projects to withdraw almost four times the Estimated Sustainable Income from 2018 until 2021; this will reduce the PF balance by almost a quarter by the end of 2021, from today’s $16.8 billion to $12.8 billion. It could fall even further if PF investments do not earn the expected returns (returns were negative in 2015 and 26% lower than projected in 2016), or if domestic revenues do not increase as quickly as the Government hopes. La’o Hamutuk estimates that without major changes to the Government’s current course, the PF could be entirely depleted by 2028. The Government and lender agencies also argue that concessional loans are ‘cheaper’ than withdrawing the same amount from the Petroleum Fund, as they say that the interest rates on the loans are less than the returns on PF investments that would be lost by withdrawing the same amount from the PF. However, while the PF’s average return so far has been greater than the interest on concessional loans, these earnings will dwindle as the PF’s balance falls, eventually reaching zero when the Fund is empty. However, Timor-Leste will still have to pay back the loans, with interest, regardless of how long the PF lasts, which will place extraordinary stress on an already tight budget. La’o Hamutuk is also concerned that the Government could be tempted to take out commercial loans (which come with much higher interest rates) for some of its largest planned projects, as most of Timor-Leste’s current creditors are unwilling to lend for them. Creditor agencies like the World Bank and ADB say that they carefully evaluate each project before lending; however, less scrupulous lenders could see Timor-Leste’s petroleum wealth as a guarantee that it will repay its debts, regardless of whether the loan-funded projects are beneficial or whether repayments will negatively impact the people’s well-being. Loan proponents also contend that Timor-Leste can access technical assistance (TA) by borrowing from international agencies, which helps to improve the quality of project implementation. However, Timor-Leste does not need to borrow money to access TA – either we can hire experts directly, or donors may provide it for free or below cost. Timor-Leste pays for TA when it comes with a loan – the cost of the assistance is added to the balance of the loan, which we will have to repay with interest. Some have also said that borrowing is a way of ensuring that projects are implemented well, as the creditor agencies bring technical experience and oversight. However, using loans as a way to bypass poor project management is not a sustainable solution – the Government needs to improve its own processes, rather than taking loans to avoid having to do so. In addition, as Timorese firms still lack the capacity to implement major construction contracts, most of the borrowed money will go directly to foreign companies. If the Government paid for the projects directly, it could require joint ventures between local and foreign companies. This would build the capacity of local companies, while also bringing more benefits to Timorese workers and the local economy. The Government has also justified its borrowing on the grounds that loan-funded projects have high social and economic returns that outweigh their costs. Timor-Leste’s currently-signed loan agreements are for road upgrades and a drainage project in Dili, and these projects will have some social and economic benefits by improving transportation, safety and quality of life. However, out of $1.3 billion ($1.2 billion projected in the 2017 State Budget plus $85 million in new loans signed in 2017) to be spent from planned new loan agreements over the next five years, more than $900 million is for just three projects: the expansion of Dili airport, and two components of the Tasi Mane petroleum infrastructure project – the south coast highway and the Suai Supply Base. For years, La’o Hamutuk and many others have argued that these projects – especially Tasi Mane – will waste Timor-Leste’s people’s money, while bringing financial, social and environmental costs that far outweigh their potential benefits. Even if Sunrise gas eventually comes to Timor-Leste, Tasi Mane’s economic feasibility is doubtful; La’o Hamutuk fears that if the Government decides to use public money to subsidize the project, a large portion of Timor-Leste’s petroleum wealth will be squandered. Meanwhile, the project would take over large areas of agricultural land, thousands would lose their homes and livelihoods, and Timor-Leste would be at great risk of environmental damage and pollution. Borrowing to pay for these projects does not make them viable; it merely allows politicians to build these unrealistic dreams without paying for them -- burdening future generations with heavy debts. How much will Timor-Leste have to pay back? The State Budget documents lack meaningful information on expected loan repayments, so La’o Hamutuk has estimated how much Timor-Leste will have to pay back if it follows the plans described in the 2017 State Budget. However, due to fluctuating interest and exchange rates, and the fact that the Government declines to make some repayment obligations public, it is difficult to know exactly how much Timor-Leste will have to repay. Our analysis shows that even if Timor-Leste signs no additional loan agreements after 2017, it will have to pay back an average of $24 million per year between 2022 and 2036. If no other oil and gas fields come online, the Petroleum Fund runs out in the mid-2020s, and domestic revenues increase by 9% per year starting in 2018 (this is optimistic, especially as many 'domestic revenues' are fees the Government pays to itself, which will decline when oil money runs out and the Government is forced to reduce spending), the State’s total annual income will average about $420 million per year throughout the 2020s. This means that around 6% of Timor-Leste’s revenues will be diverted to repay loans. This will leave around $320 million per year – plus whatever remains of the PF – to pay for everything else in Timor-Leste’s State Budget. To put this in perspective, recurrent expenditures alone during 2016 was $857 million. If the proposed tax reform doesn’t meet its targets, there will be even less money available. Moreover, recurrent spending will be even higher ten years into the future, as Timor-Leste will have more, older infrastructure to maintain, people will expect better-quality services, and the population will have increased by about 20%. What happens if Timor-Leste cannot pay? 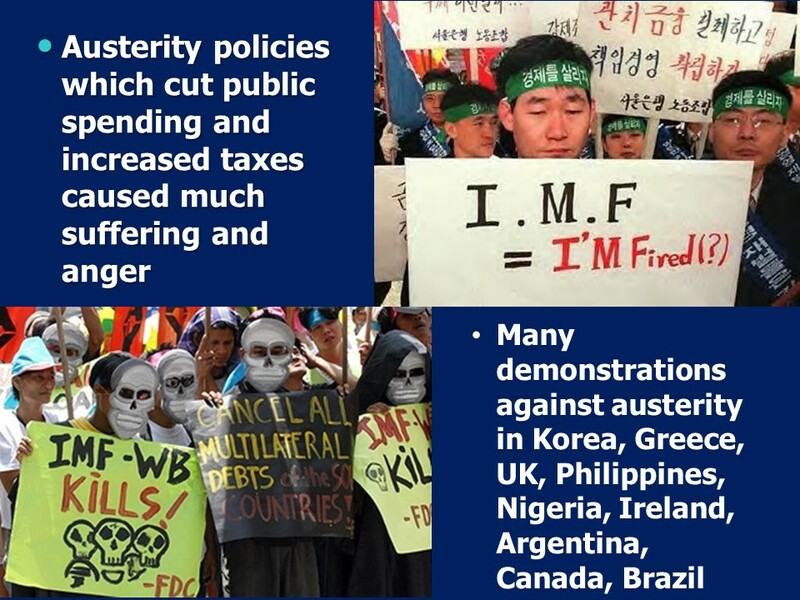 If Timor-Leste’s policy makers fail to heed the warnings of La’o Hamutuk, the World Bank/IMF and others about unsustainable spending and the risk posed by excessive borrowing, the country might borrow more money than it can repay. If this happens, it is highly likely that Timor-Leste will have to surrender some of its hard-won sovereignty to outside agencies in order to be have its debts "restructured" or reduced. 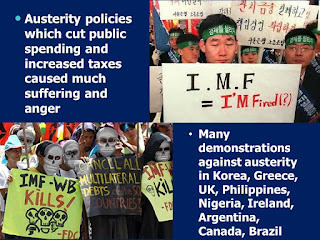 In the past, creditor agencies (especially the IMF) imposed Structural Adjustment Programs (SAPs) on indebted countries which aimed to enable governments to pay their debts by reducing public expenditures and generating short-term income. SAPs required countries to liberalize domestic markets, sell off public assets to private investors (often at discount rates), cut public sector wages and employment, increase fees for public services and reduce spending on education, health care, social welfare and government subsidies. 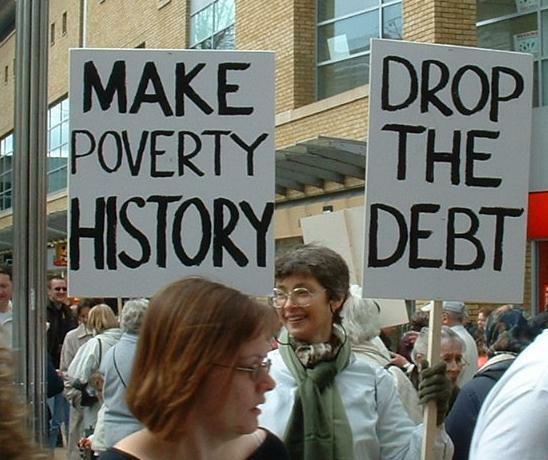 SAPs were heavily criticized by many activists, NGOs, governments and economists due to their negative impacts on the poorest people and countries, as cash-strapped governments were forced to continually divert their limited funds to paying creditors rather than investing in essential services, poverty reduction and economic development. Due to the failures of SAPs and their negative impacts, they were replaced by Poverty Reduction Strategy Papers (PRSPs) in the late 1990s. A PRSP is a plan that the Timor-Leste Government would develop – under the “guidance” of creditors – to change monetary and fiscal policies in order to qualify for debt relief or restructuring. PRSPs are supposed to be better than SAPs, as they are ostensibly owned by governments themselves, rather than imposed by creditors, and they are supposed to involve civil society participation and promote poverty reduction through “inclusive” economic growth. However, critics argue that PRSPs are simply SAPs under a different name but with nearly the same effect, as acceptance of the PRSP by creditors (and subsequent debt relief) require governments to implement “free market” reforms in an effort to stimulate economic growth and reduce the size of government. PRSPs therefore result in many of the same policies as were imposed in SAPs, such as: privatization of public assets; cuts to subsidies and public spending; and liberalization/deregulation of local markets. In addition, civil society participation in the process has often been tokenistic, with a few meetings with government officials being considered sufficiently participatory by creditor agencies. Timor-Leste’s oil revenues will effectively end next year, and non-oil domestic revenues are not increasing fast enough to replace the money from oil and gas. Regardless of whether the Government takes more loans, Timor-Leste may soon face huge spending cuts in wages, social services and infrastructure. The austerity will hit much harder if we have failed to make meaningful progress in improving basic services and the non-oil economy. If Timor-Leste has borrowed hundreds of millions or billions of dollars for projects that fail to generate returns, paying back creditors will divert even more funds from essential areas, impacting our most vulnerable people. If we have failed to develop alternative sources of revenues and our debts are more than we can pay, default will result in loss of sovereignty, even harsher austerity and a long, difficult struggle to escape from the cycle of debt. To avoid this result, La’o Hamutuk urges Timor-Leste’s policy makers in the Government and Parliament to demand that major projects undergo full, objective cost-benefit analyses, and postpone any plans to borrow for these projects until a comprehensive analysis regarding the State’s ability to repay the loans is done and made public. This may not be enough to prevent the PF from being depleted, but it will extend its life, while freeing up resources for the Government to be able to focus on the difficult but essential task of improving the well-being of our people and developing a sustainable, diverse economy that benefits all of Timor-Leste’s people. This blog article is excerpted from a paper by Niall Almond which will be edited and published in the forthcoming proceedings of the 2017 Conference of the Timor-Leste Studies Association.